﻿ Ventless Portable Air Conditioners: The Reality! 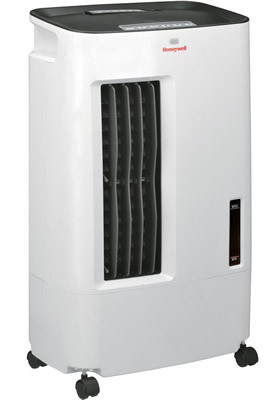 Ventless Portable Air Conditioners: The Reality! When you want to keep cool during summer, a ventless portable air conditioner without exhaust hose venting sounds like total freedom. But does this exist and where can you buy one if it does? All refrigerant-based air conditioners must have a way to vent the hot air they produce as a by-product of the heat exchange process that produces the cold air. The science is pretty simple to understand here. Just like your domestic fridge, a process that involves a motorized compressor to compress the refrigerant gas and create the heat-exchange mechanism to create the chilled air. Motors produce heat and that heat can be considerable, depending on how hard the motor is working. A domestic fridge produces a lot less hot air than an AC unit because it has far less volume of air to chill. Simply that! So whatever you might think or might be told by a slick salesman, a traditional AC must have a way to remove the hot air it produces and not exhaust it into the room that needs to be cooled. That means it has to go outside somehow! That somehow is via a venting duct or hose. A fixed, mini-split or window AC system has a permanent link to the outside of the building so there is no need for a hose. 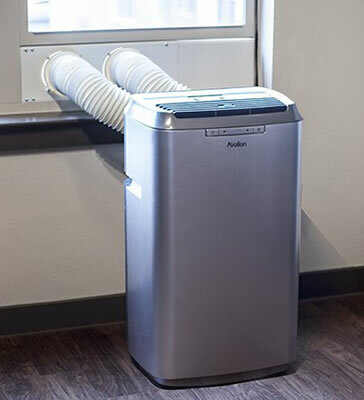 However, a portable AC unit needs a flexible hose that must be connected to a suitable exterior venting hole, window kit or sinply hung out of a window to allow the hot air to get out of the room. The alternative way to create cool air indoors (or out) with a free standing, movable unit is to get an evaporative or swamp cooler. This type of device does not employ a refrigerant plus compressor system to create cool air, and so does not produce any heat. Simply put, these coolers do not need to be vented and are therefore truly "ventless" coolers. Unfortunately, while they are indeed ventless and portable and they do produce lots of cool air, they are NOT air conditioners! They rely on the evaporation of moisture to create cold air that is forced through and out of the unit by a powerful fan. The air comes into the unit, is saturated with moisture and blasted out many degrees colder than it went in! The other major point to bear in mind here is that a true AC can use upwards of 2 kilowatts of power (2,000 watts) to run, while a comparable evaporative unit only needs to use between 100-200 watts to do the same job. That represents a considerable saving in energy and results in much lower energy utility bills for the summer! The major downside is that evaporative coolers do not perform very well in areas of high humidity. Their ability to produce cold air is greatly reduced as the level of moisture naturally occurring in the air rises, especially above 50-60%. Would You Buy a Portable Evaporative Cooler? If you believe where you live has the right circumstances for an evaporative cooler to work well and provide you with low cost coolness, why no take a look at one of the top models currently on sale online? There are some really great units on sale right now, but it makes sense to get the best of the available models when it's offered. It just so happens that I ran across this top rated cooler the other day while searching for stuff on Amazon and I was so impressed, I thought I would share it with you. It's made by Honeywell, a highly respected brand in air coolers and is pictured below. You can click the image (right) to visit the Amazon product page for full details, customer feedback and specifications. Uses 230 watts of power: significantly less electricity than AC! Please note: This device works best in hot dry climates, ie the air humidity is low. Here's another great swamp cooler from Honeywell that is lower in price but still big on features. And it looks stunning too, so I bet you can just imagine this amazing machine in your room keeping you cool this summer! Uses only a meager 100 watts of power! Here is a really attractive, energy efficient yet powerful spot cooling appliance for your home or workspace. It cools in the most natural way and that makes it perfect for a bedroom, child's playroom, home office, living or dining area. If you live in an area with low humidity, you are in luck as you can take advantage of the low power consuming evaporative option to keep cool. If you have high humidity, your options are limited to the more costly AC along with the vent hose and the hassle! You can find out a lot more about what we often refer to as a "ventless portable air conditioner" but is not really an AC, but is an unvented air cooling option in a great and highly informative website that really gets into what the type of "portable air conditioner no vent" coolers really are. And it provides a lot of great resources for buying the best of them for your needs. © 2019 www.bayairhvac.com Bay Air HVAC Services Inc Intellectual Property. All rights reserved.